Egypt in 1836 has little wealth, no friends and many enemies. 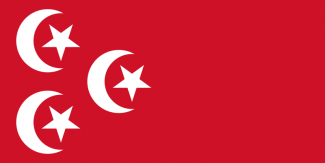 The Albanian Mohammad Ali has carved out an Egyptian empire in the Middle East, independent in all but name from his nominal sovereign in Constantinople. But the project is faltering, the Europeans are eyeing Egyptian lands greedily, and Ottoman Empire are all too eager to take back their Syrian possessions. Egypt is guaranteed a tough fight staying alive while attempting to westernize and industrialize. The great powers will compete to sphere Egypt because of the Suez Canal. This will get them a powerful protector to defend against the Turks. But the Great Powers will slow one another in the process and Egypt will stand alone for some time. The Ottoman Empire will declare war on Egypt; regrettably Russia loves to befriend them and as an uncivilized nation allies are hard to come by. 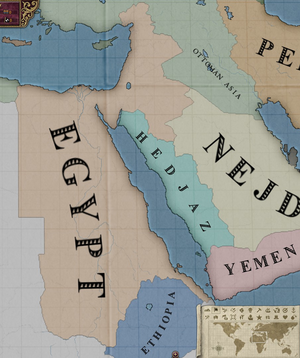 If you fight hard, you will be able to lose minimal territory, conquer some of the Arabian nations for the research points to allow you to civilize and be prepared to fight the Turks again. Ethiopia will also make a nice addition to Egypt's population. Sokoto can be a later target of conquest. They have a good population too and will add a lot of soldiers to the army. It will also make it possible to colonize the gold coast, which is the most valuable part in Africa, if Egypt westernizes in time. Egypt has the decision Muhammed Ali's Reforms which will give a +50% modifier to research points. It is a tremendous help to westernize, but it might be better to wait to enact it, since the base modifier will increase as Egypt gains better literacy and more clergy, and the positive effect will then be even better. Taking enough land, being civilized and becoming a great power allow Egypt to form Arabia by influencing the other Arabian countries. This greatly increases the country's power and allows it to stand toe-to-toe with the greater powers of the world. Egypt will gain cores in all of the Arabian lands in North Africa and the Middle East. Egypt is the strongest country in the region and can easily take all of the land. Iraq is the only land which will be a bit harder to take because it is owned by the Ottoman Empire. You can consider to take the decision Form Arabia once a single nation is sphered or to wait until as much is sphered as possible. If one chooses to form Arabia as soon as possible Egypt will then only annex that single nation while the other remain independent. On the other hand, there is a lot of potential prestige from those wars, which is relatively easy to win considering the Egypt will most likely be the only westernized Arabian nation. Egypt have one of the best positions for colonization, and even though it is tough to become a secondary power and get the needed techs and the needed colonization points, it can be a possibility to get a lot of prestige and manpower as Egypt has direct access to Uganda, Somalia and other populated provinces of sub-Saharan Africa.